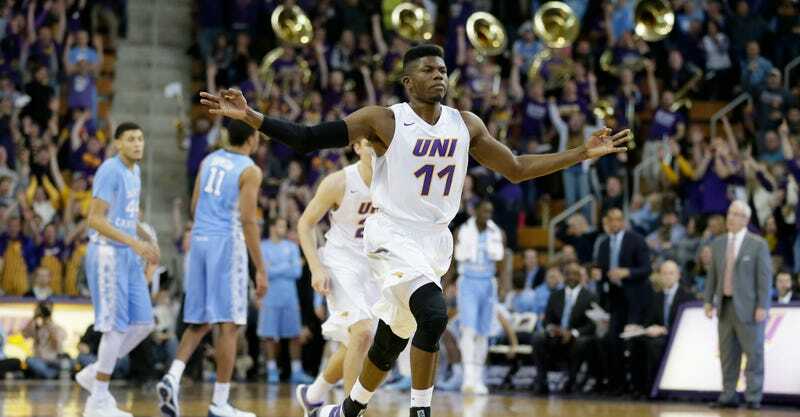 #1 North Carolina went down to Cedar Falls, Iowa to take on Northern Iowa and lost 71-67 after the Panthers capped their furious comeback (they won the second half 39-26) with a game-winning steal. Pretty good cornerback instincts here! Naturally, fans stormed the court. North Carolina took a game-high 12-point lead heading into halftime, or rather, it would have been 12 if not for this period-ending shot from well beyond halfcourt. Northern Iowa has a history of giant killing, albeit typically later in the season. They slew top-ranked Kansas in the 2010 NCAA Tournament after Ali Farokmanesh hit a long three to seal it. While losing to a Directional Midwest State is usually quite the black mark on a prestigious team’s tournament seeding prospects, Northern Iowa is one of the best teams in the Missouri Valley Conference. If anything, this will be a resume-leading win for UNI.